In Beach House Baking: An Endless Summer of Delicious Desserts, pastry chef Lei Shishak shares her most popular recipes for morning treats, cupcakes, crisps, cookies, pies, ice cream sandwiches, frozen pops, and beverages from her celebrated Sugar Blossom Bake Shop in the charming beach town of San Clemente, California. 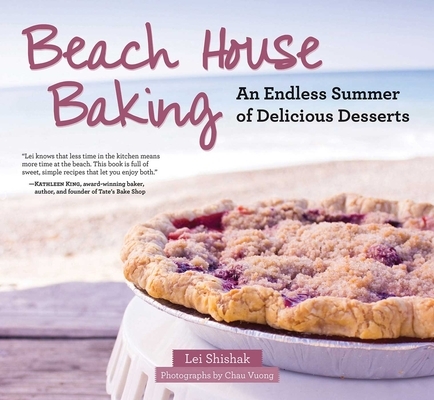 Lei’s recipes in Beach House Baking are designed to take you on an island vacation, turning the task of baking into a virtual journey to a beachside paradise, filled with the sounds and aromas of the places you can go to just get away from it all! Lei Shishak is an established pastry chef who trained at the CIA in New York and has worked at restaurants in Sun Valley and Los Angeles. Her formative years were spent working as Michael Mina’s pastry chef at the Stonehill Tavern at the St. Regis Monarch Beach in Dana Point, California. She has been featured in People, Riviera Magazine, Sunset Magazine, Coast, the Los Angeles Daily News, Fine Living, and many more media outlets. She resides in Dana Point, California.